Two guinea pigs, John Willy and Freddy McGee, are bored of sitting in their cage where nothing ever changes. One day, when their cage door is left open, the guinea pigs decide to go exploring throughout the house. They end up traveling through the tunnel of a pool table and run for their lives when pool balls start rolling through the tunnel. The guinea pigs run for the safety of their cage but when they get there and see how everything is the same, they leave to start a new adventure. 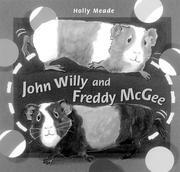 Meade, Holly, “John Willy and Freddie Mcgee,” Children's Picture Book Database at Miami University, accessed April 24, 2019, https://dlp.lib.miamioh.edu/picturebook/items/show/11334.